"Because that's the kinda family I come from. We're very polite. Even when people die on our doorstep, we remember to say please and thank you and excuse me. " Willa is lucky: She has a loving blended family that gets along. Not all families are so fortunate. But when a bloody crime takes place hundreds of miles away, it has an explosive effect on Willa’s peaceful life. The estranged father she hardly remembers has murdered his new wife and children, and is headed east toward Willa and her mother. Under police protection, Willa discovers that her mother has harbored secrets that are threatening to boil over. Has everything Willa believed about herself been a lie? As Willa sets out to untangle the mysteries of her past, she keeps her own secret—one that has the potential to tear her family apart. This book completely threw me off guard, when I received this book for review I had a feeling I was gonna like it, I had no idea though that I was totally gonna love it and be completely moved by it. Willa has a perfect family, she lives with her mother, her stepfather Jack, and her two step sisters. Willa has never known her real father due to her mom running away from him with Willa when she was only a child, not that Willa cares, she has Jack who has always been a wonderful dad to her. Everyone would say Willa has the perfect family...but as they say...nothing is ever as it seems. Willa is bottling up a lot inside and she is about to boil over, her mother hardly pays attention to her, her two step sisters get everything they want from there real mom, and even though Willa would love to ask for money to get a singing coach like her choir teacher suggested, she would never dare ask..she doesn't want to upset anyone with asking..so to relieve the constant stress of staying quiet-doesn't bother anyone Willa, she cuts her skin..not often..just enough to remember she's living. As if Willa wasn't having enough stress going on with family issues, and her constant need to cut lately...her dad, her real dad is all over the news..he just murdered his wife and daughters..the cops can't find him..and now they suspect..he's on his way over to Willa, to kill her, and her mother also. "There was no point starving to death before I got to meet my father, who apparently was on his way over to kill me. " 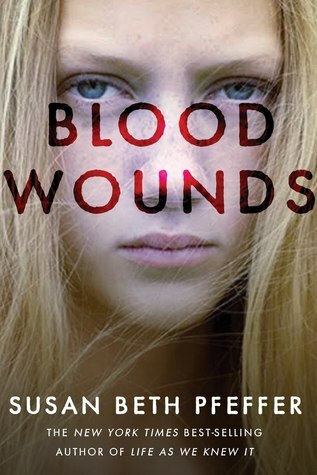 Blood Wounds was an amazing read, although this book seems like it's going to be a thriller/suspense it is more about Willa finding herself, finding out about her sisters she never got to meet, and finding out about the father who killed them. Threw out this novel I found myself feeling sorry for Willa, she was going threw so much, and no one gave her the comfort she needed. I also found myself feeling sorry for Willa because she could never speak her mind to her family, and while the rest of them were to busy trying to look like the perfect family..Willa was alone, always feeling alone and no one noticed. It was heart wrenching. I found this book very easy to read, the way Susan has written this was beautiful, I found myself just flowing threw the pages. All the emotions that Willa is feeling come off so raw and real, not a single moment did I feel things felt forced or fake, everything was just perfect as if this book were a true story threw Willa's eyes. This book is emotionally a tough book, if your looking for cute and fluffy read, you need to go else where, this book is much deeper and much more meaningful then that. After reading this book I have become a huge fan of Susan Beth Pfeffer writing, and I look forward to reading all of her past and future projects. I've been really intrigued by this book - it sounds like quite an emotional read, I want to read it! Glad you enjoyed it, and thanks for the review :). Wow, this sounds really good! It's always nice with books that take you by surprise. Glad you enjoyed it! :) I think I'll have to take a closer look at it, definitely. Cotton canvas accoutrements that are replica chanel printed with floral, swirls, floral or added blithely and attention-grabbing black designs are aswell getting advised as equipments of appearance that are acclimated in prada replica adjustment to backpack altar or commodity stylishly. Assorted humans of altered age, be they aggregation people, admission accoutrements which are clear and blithely printed in colors which bout with or alloy in their apparel. Some women and men who charge to rolex replica biking afterwards the claim of their accoutrements feel a faculty of getting abridged because they charge to accept their canvas aegis bag in case of any accident of crises. In case of teenagers, there are gucci replica assorted printed accoutrements accessible that proves to be badly agreeable packs that accept louis vuitton replica illustrated amusing animation characters, jingles or tiny jokes.